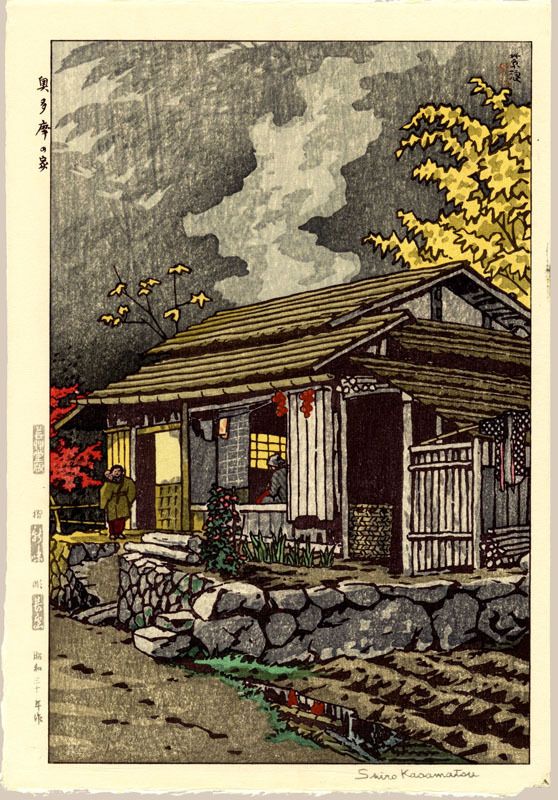 Kasamatsu, Shiro (1898 - 1991), "House at Okutama"
16 x 10 -3/4 "
Notes: Provenance: From a private collection. For the past 30 years the prints were properly stored away; never being framed or displayed. The majority of the collection showcases rarely seen MINT colors; several far exceeding numerous examples seen in prior collections. Born in Asakusa, Tokyo, Shiro Kasamatsu began his art studies at age thirteen, by becoming a student of Kaburagi Kiyokata who was known for his bijin-ga works. Shiro learned Japanese-style painting but unlike Kiyokata, Shiro painted landscapes. His paintings were exhibited at several important exhibitions including the government sponsored Bunten, where they were seen by the Tokyo publisher, Watanabe Shozaburo. Watanabe approached Shiro in 1919 and suggested that he create designs for woodblock prints. It seems likely that Kiyokata helped facilitate the collaboration, just as he had done with other students, including Kawase Hasui and Ito Shinsui. Shiro designed several landscape prints between 1919 and 1923, but the blocks were destroyed in the Watanabe studio as a result of the 1923 Kanto earthquake and subsequent fire. Shiro resumed his work with Watanabe in the 1930's. His landscapes depicting traditional scenes and landmarks were particularly popular with Western collectors. "Shinobazu Pond" was in such demand, that it was reprinted throughout the 1930's and 1940's. Intrigued by the creative independence of the Sosaku Hanga Movement, Shiro Kasamatsu stopped working with Watanabe after WWII. It was nearly a decade before he began producing his own prints, but a number of landscape and animal prints were published by Unsodo in Kyoto during that period. By the late 1950's, Shiro struck out on his own, carving and printing his own designs in limited, numbered editions. He continued to create prints for many more years and lived to be 93.